Come to the city of Prato to check out MakeTank’s temporary show room! We have many cute products on exhibition until early April. The showroom is located at Hangar Fantacci/Design Store in Via Frascati 67 in Prato. All the products showed in the shop come with barcodes, with which you can easily use your cellphone to scan and get more information about them. Here are the paper lamps that not only light up your room, but also light up your life with words said by Steve Jobs and John Fitzgerald Kennedy. The Steve Jobs – Paper Lamp has his most famous remark, “Stay hungry, stay foolish”. The other one, the JFK – Paper Lamp, has Kennedy’s inspiring speech on the Apollo space program. The JFK lamp is only 40.00 €. And what is more important is that you can get Steve Jobs lamp with a discount of 15%. It is only 38.50 € right now. A smiling star composes Star – Magnetic Board on where you can write your dreams or hang your artwork on it! The product is made of steel laser, painted with RAL colors. It can also be a decoration in your kitchen or living room and you can get it only for 60.00 €. It makes your room lively and bright. Come check it out in the city of Prato! Are you looking for furniture that works both as a table and as a pouf? 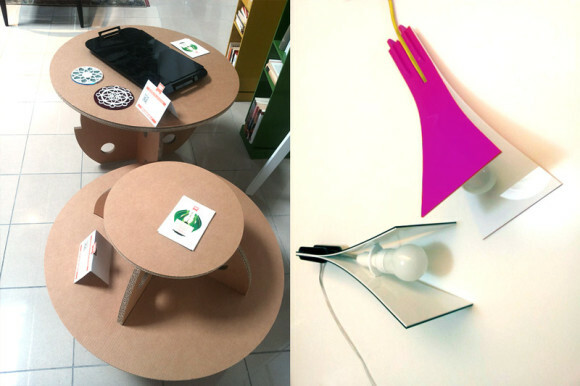 The Coccinelle – Cardboard Table and Pouf is the solution! It helps you to organize your home and save space. Although it is made of cardboard, it is very strong with great quality. It is easy to assemble as well! You can get it through MakeTank for 80.00 €. Leddy, Table Lamp is also available in the showroom in the city of Prato. Leddy is a black acrylic LED table lamp. It can be converted to many positions, whichever you want! It is compatible with LED bulb, which saves a lot of energy and it is good for the environment and you can get it for 79.00 €. The Televisione TV – Wall Clock is a red TV-like wall clock. It decorates not only the wall, but also the whole room with a little bit sense of humor and irony. The design of the wall clock is modern. It goes with all different styles of decoration. It has been realized in laser cut plexiglass. The clock is available on MakeTank for 69.00 €. Hemisphere Black Opaque – Amplifier for iPhone and iPod is not only an elegant amplifier, but also works as an accessory or decoration in your office or home. It works naturally, without the need of electricity. What you need to do is put your cellphone inside the amplifier, there is no need to plug in! The glazed ceramic surface is totally crafted by hand. You can get it through MakeTank only for 129.00 €. The Pregadio Hanger Aqua Green is a clothes hanger with bright green color. It is a great combination of clothes hanger at the top and shoe rack at the bottom. The useful design saves more space for your home. The whole product is made of birch with good quality and also friendly to the environment. The components are assembled to joint, therefore it is firm and lasts for a long time. It only costs 350.00€ on MakeTank. This is just a snapshot of our exhibition in Prato. 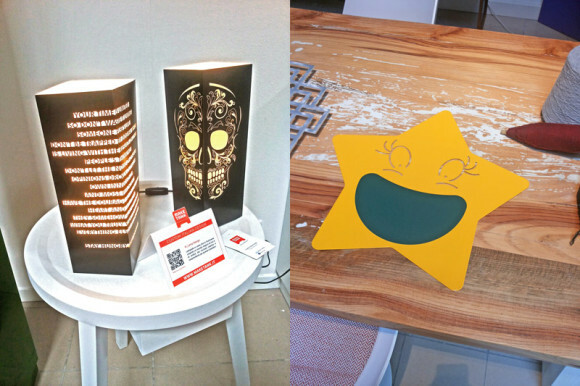 Come to Fantacci Design Store to admire our products face to face and happy decorating your home! There is more information on all other products MakeTank have on the home decor part of the website. Come check it out!